For supervisors or production managers is very important to know the floor capacity to plan their production efficiently. Calculation of capacity is very simple but you must know the line efficiency. The other important factor to calculate floor capacity is manpower absenteeism%. 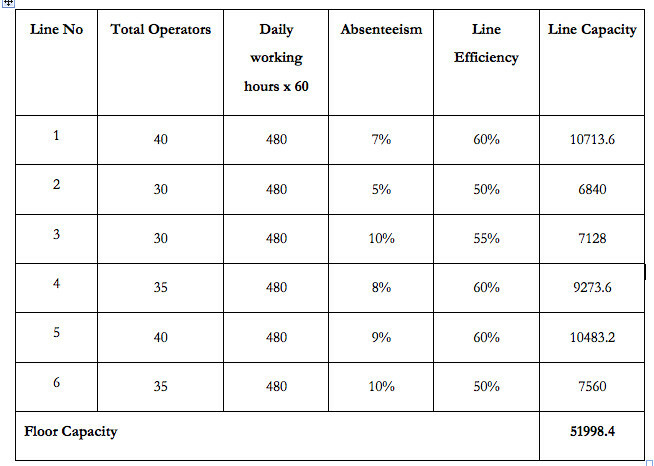 So you must know the line wise efficiency and absenteeism %. You can calculate the efficiency in minutes or hours. To calculate the floor efficiency, first line wise efficiency needs to be calculated and the sum of this will be the floor efficiency. Example: A factory floor has 6 lines, works for 8 hours day. Absenteeism and efficiency mentioned below in the table. I f you have the SAM value of the product you can represent capacity in the pieces also. Just divide the total capacity by SAM value . For example the SAM value of a trouser is 35, So the capacity in pcs will be 51998.4/35 = 1486 Pcs per day. They are all skill that may be employed together to manufacture a powerful and impacting change to better the persons life. Previously . will assistance a successful point of action where your subject takes the reigns and learns to experience more fulfilling life because of their work with you.